April 13 is a big day for all reWASD users (and developers :) ). reWASD 1.4 released, so now you have an opportunity to map controller to keyboard and test all the features we’ve implemented since the last version of the best gamepad mapper came out. We appreciate and consider your feedback, so don’t be shy and share your opinion, wishes, anything. You can contact us here in the comments or on our Facebook page. Now, back to the features! Please unplug the controller before installing the update and plug it in after reWASD 1.4 is installed. If the new version doesn't recognize the controller, repeat the steps: unplug the gamepad; uninstall reWASD; install it again; plug-in the controller and launch an app. If you have issues with reWASD on Windows 10 Creators Update, please check this note. reWASD Shift Mode — map even more buttons to Xbox controller! The best thing about any gamepad is that all the controls are placed on a single, handy device. The worst is the limited number of buttons. Even Xbox Elite paddles can’t help in several cases. Our gamepad mapper became even more powerful — reWASD brings Shift mode! Basically, you choose Shift button in reWASD (it can be any of controller buttons), and while you press and hold this button all other controller buttons may be assigned to a new set of actions. Note: reWASD differs the main configuration and Shifts, and if some buttons inside the Shift are unassigned — your main mappings will perform. Share your own configs created in our gamepad mapper. 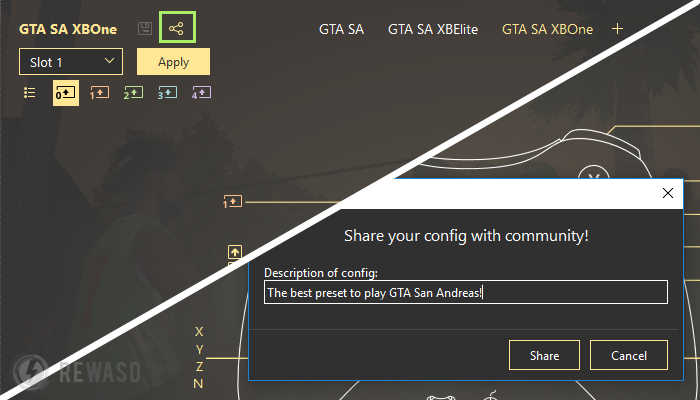 All you need to do is to create a config, remap controller to check your settings, press “Share”, add the name of your config and it will be posted right away! Add the name of a game so it would be easier to find the config you’ve made. 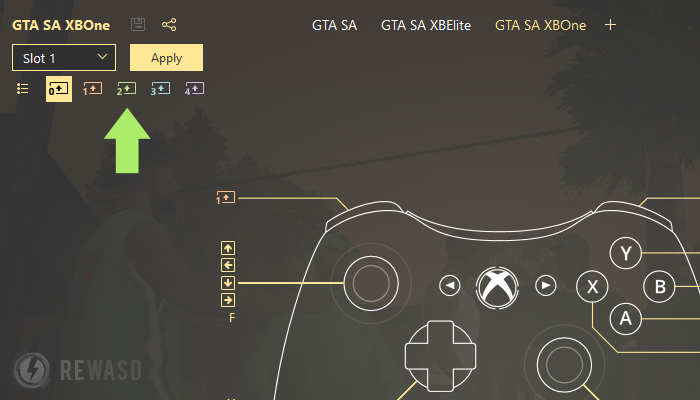 We’ve added one more improvement to allow you to map controller to keyboard easier: now you can clearly see what configs are applied to Xbox Elite slots. 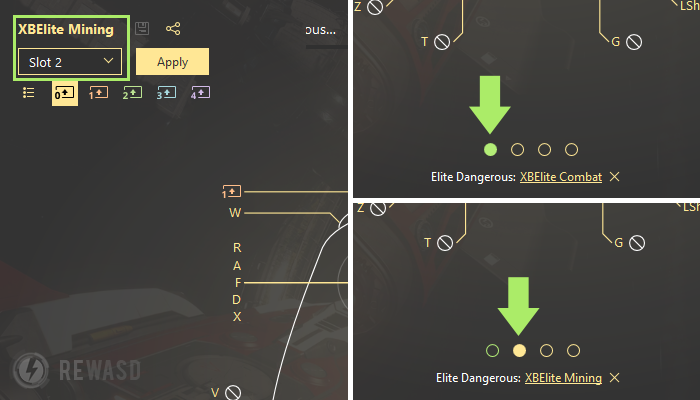 No matter if it’s the main screen you’re looking at, or if you’re editing the new config — you always have access to two configs that are assigned to Xbox Elite slots. Each config has a link, and if you need to modify one — just click the name of a config and you’ll be redirected to the chosen config. Want to brush up how you mapped controller to keyboard? 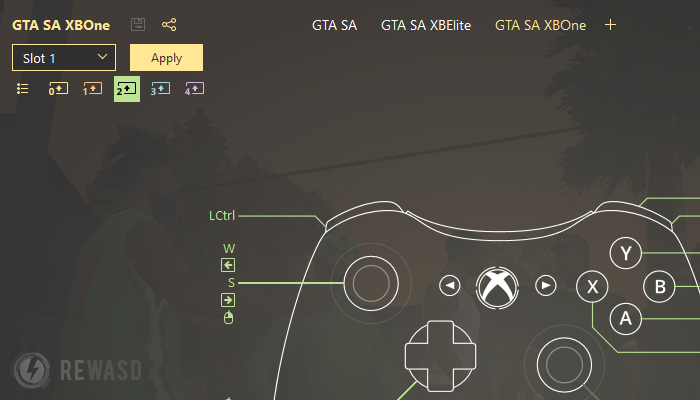 Just open reWASD and switch between Xbox Elite slots: you’ll see the mappings on the start page. Feel that this config is not needed now? Choose the slot and click “Restore to defaults”. As I’ve already mentioned the Shift mode — we have another surprise for you. Sure you’ve heard of Elite: Dangerous game. It’s not that user-friendly with those complicated controls, weird native controller support and endless trainings. reWASD Shift mode made it possible to map controller to keyboard and create a handy config. I’ve made one config for Xbox 360 or One and two for Xbox Elite — one for mining and other one for combat, they’ll appear in reWASD once you install the update. Before you start playing, go to Options — Controls and choose “Keyboard and Mouse” preset so the config(s) would work appropriately. Still, there are plenty of controls to remember. The following screens will guide you through these configs. Your feedback is the prior for us. We’re always glad to hear anything from you, so if you have something to say don’t hesitate to contact us via Facebook messages or comments. To keep your hand on the pulse, follow our Facebook page or Pinterest board, we'll let you know each time a new post appears in reWASD blog.